When you hear the roar of automotive engines and catch a glimpse of giant roostertails, chances are pretty good that inboards are on the water. 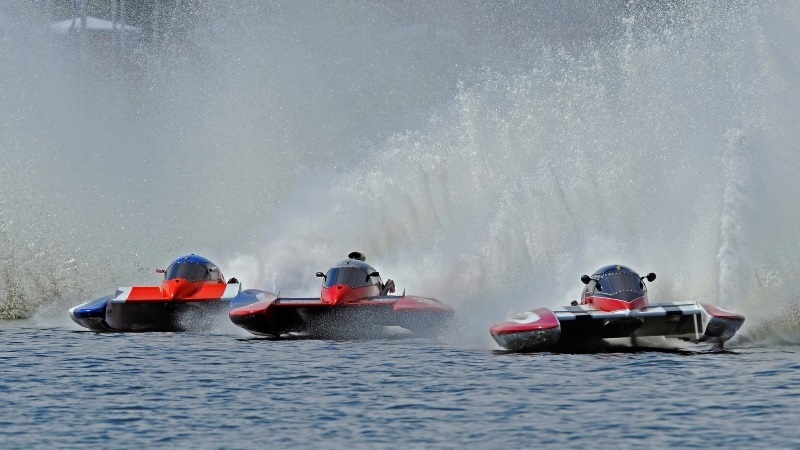 As the largest category in the APBA, Inboard racing classes include both runabouts and hydroplanes that are fast, fun and LOUD. Classes span from wild Jersey Speed Skiffs (70mph) to supercharged 1,500 horsepower Grand Prix Hydroplanes (170 MPH). The minimum age for racing in this exciting category ranges from 14 to 21. Inboard racing requires an unmatched level of teamwork and professionalism, as well as a family atmosphere with life long bonds between owners, drivers and crew members; and that is exactly what powerboat racing is all about. Inboard racing classes consist of both Runabout and Hydroplane classes. You can tell a boat's class by the letter(s) next to the boat number. All inboard drivers are required to wear a racing helmet and life jacket as well as other protective gear such as fire-resistant Nomex and cut resistant Kevlar. Drivers who race inboards with an enclosed cockpit (capsule) are required to pass APBA capsule training and certification every two years. Nobody plans to flip, but it does happen from time to time... and when it does happen, the training pays off. Hydroplanes glide over the water on a cushion of air, with only the propeller and sponsons on each side touching the water while air rushes under the hull, giving the boat the "lift" it needs to skim across the water. These bad boys are fast, with some classes running at speeds in excess of 150mph - Inboard hydroplane classes range from 1 liters (T-Boats) to the 1500hp supercharged Big Block Chevrolet V8 Grand Prix (GP). All inboard hydros utilize a capsule safety cell as well as racing lap and shoulder belts. Controls are similar to those of an automobile - steering wheel, accelerator pedal, rear view mirrors - but no brakes! WATCH OUT for roostertails! If an inboard hydro is in front of you, chances are you're about to get blasted with a wall of water from the giant roostertail of the boat in front of you. Racing into a turn favors the leader, with those behind having to deal with roostertail fallout!